As they hiked away, the owl flew overhead — close enough that Hilliard felt the breeze from its wings. Arizona Mining Inc. has been drilling to map mineral veins, the first stage in an underground mine that could produce for up to 50 years. As it ramps up production around 2020, it’s expected to need federal permits to expand. But with the owl sighting, the U.S. Fish and Wildlife Service is “leaning in” to see how the operation has grown — and what threats it might pose to local wildlife —since the agency last thoroughly examined it. Depending on what it finds, future mine expansion could be impeded. The Mexican spotted owls were in a gulch less than a mile north of the company’s drilling rigs and tailings piles. The owls, which roost in mature trees in mountains and canyons in the Four Corners region, are considered an indicator species for overall forest health. In Patagonia, home to a biodiversity unparalleled in the Lower 48, the owl has become a flashpoint in a town already divided over whether to try to resurrect the mining industry, or embrace a new identity as an outdoor recreation and bird-watching destination. 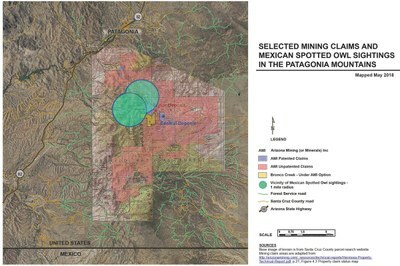 Where spotted owls have been found within the mining claims near Patagonia, Arizona. Arizona Mining, Fish and Wildlife and local birders have known for decades that Mexican spotted owls roosted in the Patagonia canyons. Two years ago, however, the agency determined that exploratory drilling posed no danger to threatened and endangered species, partly because it had no evidence that owls were nesting near the site. The mine’s contractor reported breeding in proximity in 2016, and the service confirms they received documentation of a juvenile in the area months later. Don Taylor, Arizona Mining’s chief operating officer, says the company will be a responsible neighbor. The property was mined from the 1880s until the 1960s, and exploratory drilling has gone on since the 1970s. A 2018 technical report from Arizona Mining lists half a dozen endangered, threatened or sensitive species, including the owl, ocelot, jaguar, Sonoran tiger salamander, and yellow-billed cuckoo, living adjacent to or in portions of the mining operation. In 2016, Defenders of Wildlife asked the Fish and Wildlife Service to protect the Mexican spotted owls and yellow-billed cuckoos from the disturbance and habitat loss the mine could cause. At the time, Fish and Wildlife Arizona field supervisor Steven Spangle said the agency would not investigate the operation because it lacked sufficient evidence that owls and cuckoos would be harmed by exploratory drilling. Two years ago, however, the company was merely drilling alongside roads, says Jason Douglas, an agency biologist. Since then, its operation has grown. Recent images from its website show massive tailings storage facilities that dwarf the dump trucks and backhoes used to fill them. And October’s sighting has given Defenders new leverage to assert “longstanding concerns” with the lights, noise and human activity’s effects on owls. The group recently wrote a letter urging Fish and Wildlife to ask the company to cease activities that could harm owls until it obtains a permit. 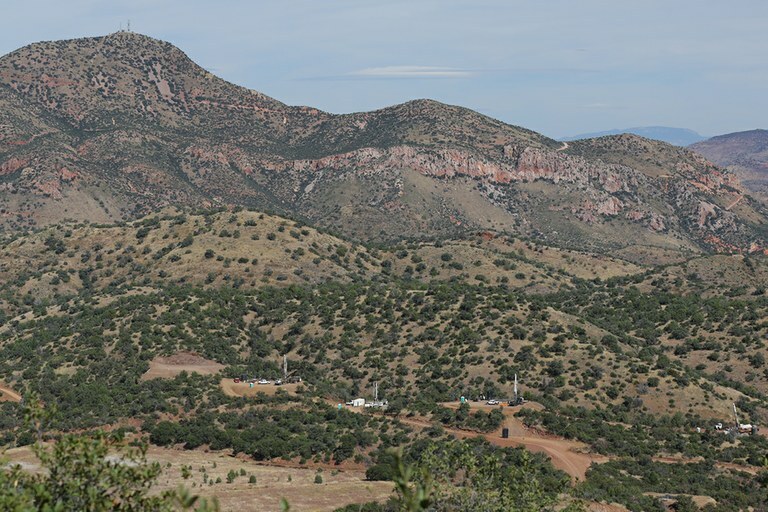 Red Mountain looms over Arizona Mining Inc.'s drilling operation. The mine operates on private, patented claims. 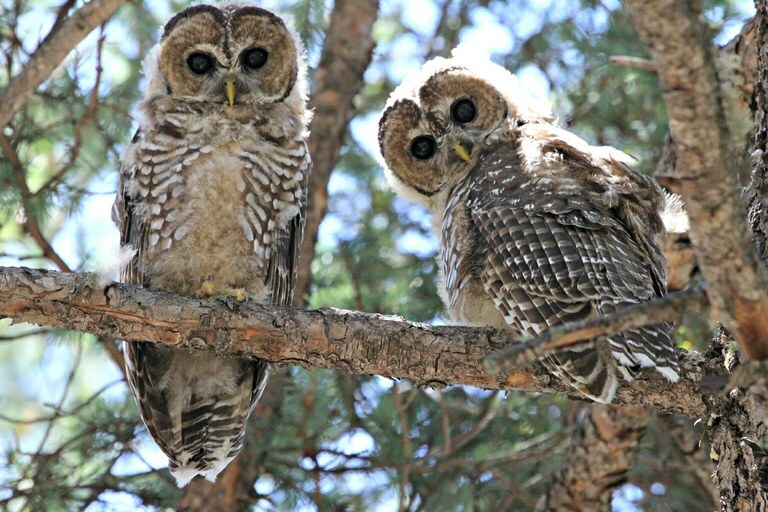 If Fish and Wildlife determines its operations do indeed threaten owls and other endangered species, Arizona Mining would be invited to complete voluntary applications that could include measures to reduce harm to the species. The company plans to expand its tailings piles, potentially reaching onto national forest lands in about a decade. That move would necessitate a federal environmental review and further consideration of possible impacts on endangered species. Mexican spotted owl numbers decline alongside the loss of mature pine forests to clear-cutting and wildfires. Only a couple breeding areas remain in the Patagonia Mountains, says Nick Beauregard, who has worked for the nonprofit Bird Conservancy of the Rockies as an owl watcher, and one of them is within half a mile of Arizona Mining’s property. Elizabeth Miller is a freelance journalist who covers public lands and wildlife management from New Mexico.